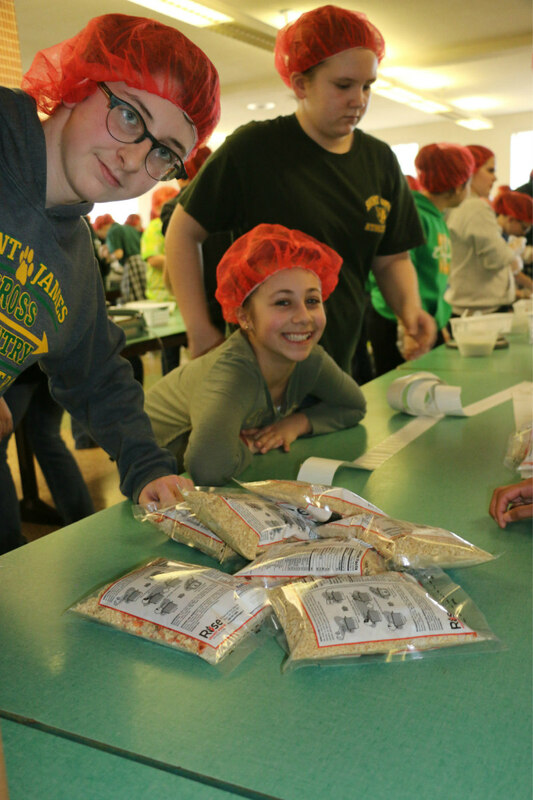 Noah Wagner, a sixth-grader at St. James School in Erie, quickly darts between aisles of his peers who are packaging dried rice, vegetables and soy protein bound for Burkina Faso in West Africa. Carrying an armful of food bags, Noah’s smile radiates the cafeteria at Erie’s St. Mark Catholic Center, where hundreds of Erie County Catholic school students gathered March 25 for a Global Poverty Project. Just as Noah completes his sentence, Andrew Moser, a representative from Rise Against Hunger, a partner of Catholic Relief Services’ Helping Hands, bangs a loud gong to let students know they reached the 7,000 mark in the number of bags packed. Helping Hands coordinates volunteers to package nutritious meals for people in Burkina Faso and other needy areas of the world where shortages of food and famine take a heavy toll. Holding one of the plastic packages of food bound for West Africa, Moser explains that a vitamin packet is inserted into each bag. Once sealed, the dried contents can last up to two years. The Catholic Schools Office, in conjunction with the Office of Social Justice and Respect Life and with a grant from the Religious Education Endowment Fund, coordinated the service day as part of a three-year Global Poverty Project. Another significant grant from the Thomas Lord Charitable Trust made it possible for the diocese to plan the Global Poverty Project. Beginning this year, sixth-graders from eight Erie County Catholic schools will learn about the underlying social justice issues of global poverty and how to take action against it. The March 25 service project was one component of this year’s effort. In February, teachers taught lessons on poverty and, on April 11, students will attend a Global Poverty Summit at Our Lady of Mount Carmel Parish in Erie. The summit will include workshops, speakers and even a taste-test of the contents of the packages that the young people packed two weeks earlier. Kim Lytle, curriculum director for Catholic schools, has been most impressed by the students’ reactions to the project. Patrice Swick, director of the Office of Social Justice and Respect Life, has been speaking to classes about her own mission work in Tanzania and the need to look beyond ourselves to help others.